I explore the bizarre and otherworldly place that is my Google Search Terms. 2. Birmingham Blogging Academy - Twitter bugs me. Twitter's bugs especially bug me. 4. Wade's Pinterest - Video of Birmingham duo The Pierces performing on "Late Show with David Letterman" this week. 99% of our blogging is on the Shoals area--primarily its politics, but often area crime that is either horribly heinous or hilarious. Join us each day if you're so inclined. 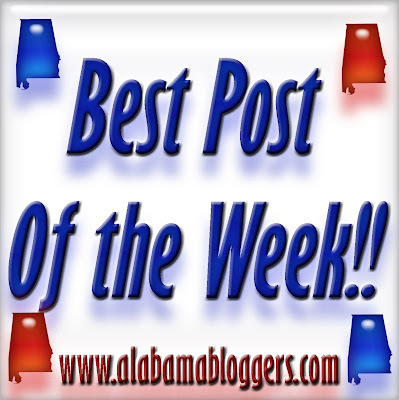 Highlights of the week from the Rocket City Bloggers. Food blogging isn't one of my core areas, but every once and a while I indulge. Working on ways to build my writing career - and that includes strengthening my blog! It's about, um, why you should thoroughly research something before using it. In my post I explore why creative, ambitious women need a girl crush and what the popularity of so-called girl crushes could mean for the progress of women. A (hopefully) humorous and helpful look at the very real disease known as "Pregnancy Brain"
Hidden Alabama Gem: High Falls Park.